The honey pot ant is a species of ant native to the deserts of Africa, Australia, and North America. In the United States, honey pot ants are commonly found in the deserts of New Mexico and Arizona. They get their name from their diet, which consists mainly of nectar and sweet plant fluids. Honey pot ants are a species of ant native to Australia, Africa, and North America. 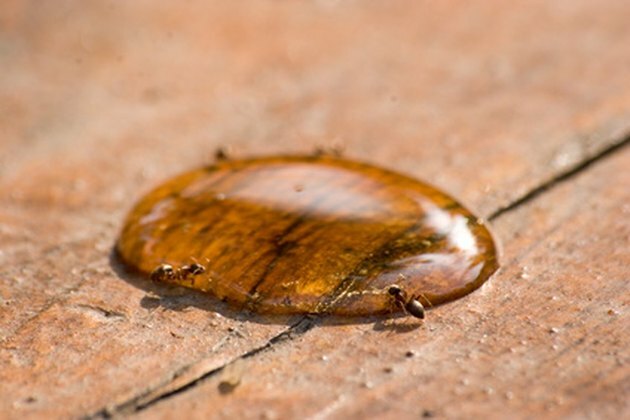 Honey pot ants measure approximately 1/4 inch to 1/2 inch in length and are dark red. Some of the ants, called "storage ants," have larger abdomens than the other honey pot ants. When filled with food, the abdomen of a storage ant can look much like a small grape. Honey pot ants eat flower nectar and other plant fluids that are high in sugar. They also feed on other insects and aphid honeydew. Worker ants leave the nest in search of nectar, honeydew and plant secretions. They ingest the fluids and when they return to the nest, the worker ants regurgitate the fluids in order to feed the honey pot ant larvae and other members of the colony. Though honey pot ants most commonly feed on plant fluids, they also occasionally gather fluid from dead animals or invertebrates such as earthworms. Like the worker ants, storage ants ingest honey, nectar and plant secretions, but instead of immediately feeding the other ants, the storage ants store the food within their enlarged abdomens. When food is scarce and worker ants cannot find enough food to feed the colony, the storage ants regurgitate their stored food in order to feed the colony. These storage ants hang onto the ceiling of the honey pot ant nest until they are needed. Storage ants often die after their stored food is consumed because their bodies cannot return to normal size once the food has been released. Honey pot ants may be very territorial, with one colony engaging in a battle with another. The victor, usually the larger of the two colonies, invades the other's nest and kills the worker ants and queen. They carry the larvae and young ants to their nest and make them a part of their colony. Occasionally, other species of ants invade the honey pot ants' nest and eat the honey pot ants because they are filled with plant fluids. Indigenous peoples of Australia have also been known to eat honey pot ants.